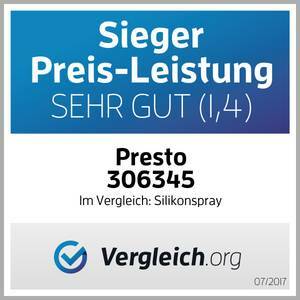 The independent consumer portal vergleich.org awarded our presto silicone spray as best price-performance winner. In comparison, the spray convinced with a very good quality at the best price with a total score of 1.4 against the competitors from the brands. As a plus, particularly good efficiency, colostresity and ease of application were highlighted.